Another reason for the dinner was Son's return home from the NASA program he attended (aka Virginia Aerospace Science and Technology Scholars/VASTS). Friday I left work early to head over to NASA/Langley for the closing ceremonies. I confess that until then I had little direct knowledge of the program, which is absolutely free of charge to those selected to participate. All I can say is if you live in Virginia and have a son or daughter who is a rising junior, you should definitely take a look at the website and encourage your student to apply. They are exposed to so much and (I'll say it again because it is important), it's free of charge thanks to the sponsors. That's it for now. Anything exciting in your neck of the woods? Sunday, on my way to run some errands, I drove down to Haven Beach. I stopped to admire these gorgeous green soybean fields. Then I drove to the Food Lion. The store manager escorts the four-legged customers to the back of the building. As I was walking into the store, I heard an employee singing, "E-I-E-I-O." p.s. Sunday is Middle Sister's birthday. We won't get to see her, but we wish her a very happy day. If it's Thursday, and it appears to be, it's time to share three things--hence the clever name Three Thing Thursday, which is where I share three random thoughts and hopefully you do too. I'll go first, because that's just how it works. Or rather, that's how it has worked in the past, not that we can't change things and have you all go first. 1. Yesterday Daughter, her friend Olivia and I, as part of our quest to forget that Son is gone for the week, traveled 81 miles to Doswell, Virginia, to Kings Dominion, an amusement park. I first went to this park back in the 1970s when it was called Lion Country Safari. Back then there was one tiny wooden roller coaster and the rest was a safari-like drive that led you past elephants, lions and zebras who were either sleeping or so depressed and unimpressed with their environment they just couldn't move. Although the safari is no more, I'll have you know that tiny wooden roller coaster is still there, and we rode it yesterday. We also rode the Rebel Yell, also there since the '70s. While I gladly observed from the comfort of my park bench, Daughter and Olivia rode all of the high-thrill rides, including something called the Volcano, which looks like a death trap that propels you straight to hell utter and complete torture. I dragged them on things like the tiny wooden roller coaster and the Rebel Yell. Speaking of yelling, my throat is still raw from all the screaming. Olivia begged dared me not to scream on the tiny roller coaster--particularly since that tiny roller coaster is intended for tiny people, also known as small children. Nope. Couldn't help myself. Screamed and laughed the whole way. 1 b. The last time we were at Kings Dominion was last summer right before Son had his major surgery. Although yesterday was intended to help us forget that Son is away this week, everything reminded me of him and those days leading up to the surgery. I'm so grateful all of that is behind us now. Also, I miss him. The quest didn't work. Regardless, Daughter, Olivia and I did manage to have a good time. 2. Tuesday evening I had a long overdue dinner with one of my first blog friends, Angie. After two hours of conversation that only skimmed the surface of catching up, we talked about dinner at my house in the fall, which is the soonest either one of us is free. That got me thinking about extending the invitation to other blog friends. After a preliminary poll about interest and availability, it looks like I'll be throwing a party here late September, a sort of reunion of some of the wonderful friends I've made from this blog. Details are sketchy at the moment, but I'm excited to have something to look forward to. Plus it forces me to clean my house, something I loathe, but which is necessary at least once a year. If you're reading and want to attend, let me know, the invitation is open to everyone. 3. After the half marathon I ran in April, I decided to give myself some time off from running to recuperate. Well, here it is July and I'm still recuperating giving myself time off. If I don't sign up for another race, there will be no motivation, no reason to run. If anyone has any recommendations for a good half marathon for the fall, no matter where it's located (preferably continental United States), let me know. Otherwise I will probably sign up to do the Outer Banks one again in November. I could keep going and write up to 23 things today, but this is too much as it is more than enough. Now it's your turn to share three things. Or three and a half things. Or one and three quarters. Whatever you want, whatever is on your mind. For what feels like three weeks the third day in a row, my internet provider seems to be trying to kill me testing my patience. Service has been intermittent since Sunday. Here's a blog post with minimal words simply because I have to post while I can, and at least I was able to load these few pictures. If you're in Mathews and see a mushroom cloud forming over the 23076 zip code and Queens Creek vicinity, you'll know the internet provider has pushed me and my very limited patience too far. Hope your week is going better than mine well. All except the last shot were taken from the public landing at Edwards Creek over on Gwynn's Island. That last one, taken from the Seabreeze, includes a glimpse of the full (or close to full) moon in the upper right corner. There's more to report, but this post will be brief. My internet has been acting up, so I want to toss this up while the gettin' is good. A storm last night must have caused a temporary outage, and it's pouring down again this evening with even more clouds headed in this direction. These were taken in 2009 from my favorite public beach located at the end of Rte. 645 in Mathews. Although most people tend to have a harsh word or sixteen two about July, I have to say that I really love it. I love the sun, I love the light, I love the warmth, I love the mosquitoes the size of pelicans sounds of the evening insects. I love the green and blue colors this time of year. July is my favorite month. The Mathews County Visitor and Information Center is in the store formerly known as Sibley's. We used to buy seeds and stuff for the garden from Mr. Cecil Sibley back in the 1970s. The store is now a wealth of local information and art. Next to Sibley's (aka the Visitor Center) is what used to be the Ben Franklin. (which used to be Farmers Bank of Mathews with a drive-through window). I have such fond memories of Sibley's, the bank and the Ben Franklin. Click here for a 2009 blog post about our Ben Franklin. Any mention of the store causes flash backs to the toy aisle dead center and all the plastic flowers on the right as you walked in. I never could understand why anyone would want to purchase plastic flowers. Confession: I possess plastic flowers and keep them hidden away in the guest bathroom. And the corner of the dining room. I could write all night about how much I hate fake flowers, but the fact that I own some would make my argument meaningless. I'm pretty sure I bought them when I lived in the city, but why have I kept them if I sort of despise them? That we've spent this much time on fake flowers is troubling. Let's return to the blog post, which is begging to come to a merciful close whether its writer is dwelling on the whole concept of fake flowers or not. 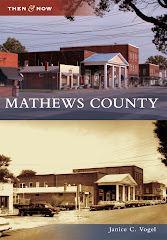 Click here for a 2010 post about downtown Mathews, which is an oxymoron references the bank, Fleet's restaurant and an odd little habit we had of closing down half a day on Wednesdays. There is at least one Ben Franklin left (click here) which we pass every time we go to Avon, NC, for summer vacation. I'm glad our former Ben Franklin is being put to such good use and will soon be full of life--and memories--once again. Does anyone have Ben Franklin memories to share? These are some shots of a few boats out of water near the railway on Tangier Island. This one was on a trash heap. I'm so thrilled they've had this opportunity to experience (and navigate mostly on their own with the help of a good friend) a place so vastly different from where they've grown up. I love that they're exploring the world. When I was a kid here in Mathews, I often made lists of things to do. Not like today's lists which include chores. No, this was just an at-a-glance list of options for whiling away the day--a day which did not include much in the way of entertainment options. 1. Ride Thunder (the pony). That last one was always my favorite. It still is. When the boat ride to Smith Island was cancelled due to low participation, I went to Tangier Island instead. Other than a brief shower crossing the bay, the weather was perfect. The day was as perfect as the weather, and it was a nice distraction for me since Son and Daughter are still in New York visiting relatives, seeing Broadway shows, eating good food and exploring a whole new world on their own. I'm picking them up from Richmond's bus station Tuesday after work and can't wait to hear about all their adventures. Click here for the first of several posts from last year's trip to Tangier. It's a unique destination and a great day trip from Reedville.